I think the nurturing comes with spending time with my kids. It serves a few purposes, like finding out what is going on in their lives, but it also plants the seed so that they remember and nurture their families one day. Definitely great ways to nurture connection. The very first institution established for the nurturing of relationships is the family. I like how you mentioned ‘planting the seed’. I’m a biggie on being an example for my kids to follow. I fail EVERY SINGLE DAY, but I always make sure to say sorry and ask for forgiveness. I also think being present is very, but very important. I adore this one! Amazing and wonderful. Awwww, thanks so much Wendy. I’m humbled by ‘adore’. Please have an amazing rest of the day/evening. Thank you so much Sibella. What a great comment and observation. Yes, it’s so true. And what’s even more sad is that so many people believe that the faith we have is a ‘religion’. I love what Josh McDowell said, “Christianity is not a religion. Religion is humans trying to work their way to God through good works. Christianity is God coming to men and women through Jesus Christ. It’s all about relationship, isn’t it Sibella. I love that relationship. I will cling to it with all I’ve got and never let go. God help me to always remain in the vine. And you are so right, when we have that relationship, everything else falls into its right place. Even when we can’t figure it all out, and don’t know the why’s and how’s of it all, we can be assured that we are the finite, in the hands of the infinite. Have a wonderful evening and weekend Sibella. Yes, religion is very far away from faith. Religion is doing things out of fear and faith is doing things out of love because God gave you a new heart and a new perspective. Yes, it’s about relationship. We may stumble and we may fall but we get up stronger because we have a great God on our side and He is invincible. Thanks Sibella. Much love to you too, my friend. Ohhhh, Staci, I love, love, love this one. The colors remind of harvest time (I’m not sure why) and the words echo of how we grow and how He harvests us for His work in His perfect time. Absolutely beautiful! Thank you so much Kirsten. I’ve been meaning to do a piece on this topic for a while. Over a year actually. Finally got down to business and did it. hahaha. I’m so glad this spoke to you. Btw, how are the plans coming along for Australia? Everything about this post is beautiful. Thanks, Staci. Hi David, thank you so much. Have you ever heard/read that quote from C.S. Lewis? I love it. This is such abeautiful message and post. I had no idea about brown sugnifying anything. Thanks for that. Well, I try to preach acceptance instead of tolerance necause they are two very different things. And Althoughm, I started my nlog to promote my writing, it has turned out I have been able to help when feel better about themselves with my philosophy. So, I hope to continue to do that. Loved this post. Thank you so much lonelyauthor. I love your comment, specifically ” preach acceptance instead of tolerance necause they are two very different things.” I agree. It may seem as if they’re the same, but in fact they are totally different. I think it’s wonderful that you have been able to help people through your blog. From what I’ve read, your attitude and behaviour toward life are outstanding, and I think they’re great. Hope you do keep on doing that. Tolerance = I will put up with it. That is not what this world needs. Thanks for the compliment. I will do my best to spread words of love, acceptance, and positivity. Thanks. Great conversing with you. I agree. You keep spreading the positivity lonelyauthor. Awwww, thank you so much Trini. So glad you like it. Ohhhh, this comment didn’t show up in my notifications. Just saw it now Trini. Thank you so so so much. You are such an encouragement to me. Such an amazing and beautiful way to speak about the need to abide in Him! It is in His presence, we find the fullness of joy. It is there that He changes us. When we learn to make this our way of life, we find that he is our life line! Couldn’t have said it better myself. Thank you so much Rose. I’m so glad you enjoyed this one. And yes, he is our lifeline. 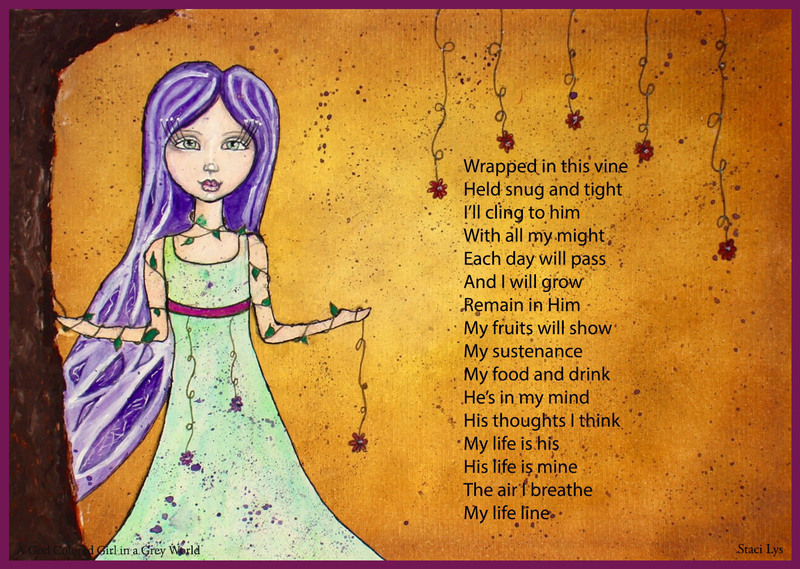 Staci, “The Vine” is beautiful, filled with such charm and grace. I really like the sentiment that you’ve captured. The artwork is stunning and the background with a marvelous ochre color is beautiful, warm and inviting. Thank you for sharing, I didn’t know that brown was associated with belonging, quite fascinating. I love that you’ve included a C. S. Lewis quote, he’s another interesting fellow that also left the Church, only to return later. Wonderful post! Please have a fun Friday and a terrific weekend! Thank you once again Mia for your kind comment, and you also have a wonderful weekend. Ohhh, I hope you had a great weekend Mia. And please have a wonderful week. Wonderful and inviting! Your artistry is applaudable in both words and colored thoughts, in images and concepts. Thank you so much Dajena. What a nice comment. I’m so glad you like this one. Thank you so much Accidentally Inked. Hahaha, oh yes, I can see why you would think that @I had this feeling that maybe this poem is going to be about purple. the purple girl will be coming along soon. Ahh can’t wait.I love purple!! Awwww, thanks accidentally inked. I will make sure to make it my next girl then, in honour of you. The poem as always deep and moving, and the colour brown a sense of belonging? That´s a new one, but it sure makes sense what you say about it. Thanks Charlie. Yea, who would have thought that brown would signify belonging. I found that out a little while back. Have a great weekend. I’m sure you’re going to spend a good amount of it on the internet eh. Hahaha. sure am going to spend quite a bit of time on the net, you too have a great weekend. Hi Diana, so great to see you. How are you? Thank you so much. Oh yes, I found out about brown and belonging a little while back when working on another art/poetry project. Love the reference to ‘worshipping holistically’ (I know you like that word, don’t you? 🙂 ). That’s just it. There is no separation between the secular and the sacred. For those that follow God, all is sacred. Coram Deo, right? Awwww, thank you so much Neha. So glad you ‘love’ it. Ohhhh really? Thank you so much Zee. I am so pleased the it moved you deeply. And I’m so glad you enjoyed the art as well. You have a great week sweetie. What does it mean if you have no desire to belong? Because in the “belonging” comes pain and heartache and you have had enough of that for more than one person. When it is so much easier just to have the Lord and no one else because He is always there, always faithful, always loving. I long for my mansion in the sky and the belonging that we will have in Heaven. Awww, thanks so much Vashti. Please forgive my delay in responding to your comment. It’s because I was away for about a week, with little access to internet. I’m so glad you like the poem. Ur art forms are reconciliation of beauty and soul and admire how they bring abut of belongingness with them always. Thank you so, so, so, so much, my friend.